Put simply, Speed Skating is literally in the name. It’s about skating as fast as you can, with as much speed as you dare. Speed Skating takes place on both roller skates and ice, with the 3 main forms of speed skating being, Long Track, Inline and Short Track. Long Track speed skating takes place on an athletic track sized sheet of ice, with skaters able to achieve speeds as fast as 60kmh. 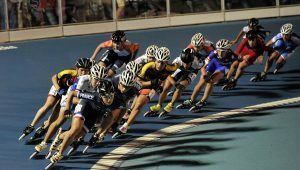 Long Track shares a lot in common with time trialling, in that skaters race in separate lanes, with the aim being to set the fastest possible time in order to win. It’s a race against yourself and your own ability to skate fast. Races vary in length from 500m to a staggering 200km. 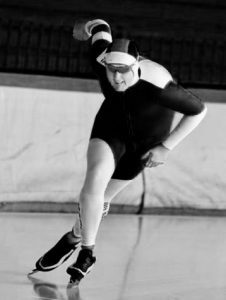 Inline speed skating comes in many varieties, including indoor, banked track and road racing with race distances ranging from 100m to 26.2 miles (Marathon). 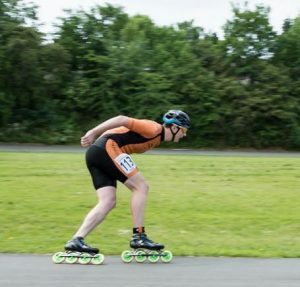 As a special mention, there is also the Le Mans 24hr event where skaters can skate Solo or as Teams over a 24 hour period, aiming to skate the furthest distance in the 24 hours. Short Track Speed Skating takes place on ice on a much smaller track size of 111.12meters, commonly on rinks used for figure skating or ice hockey. 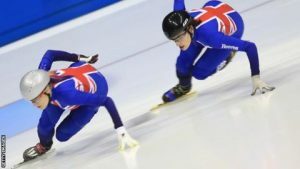 The sport has had a revitalisation in recent years in Britain due to the performances of skaters such as Elise Christie, Jon Eley and Charlotte Gilmartin. Speed Skating is for anyone who has completed the GOSK8 grade scheme and wishes to pursue this type of skating. Ipswich Skating Club currently takes part in Inline and Long Track Speed Skating, running inline sessions in and around Ipswich. 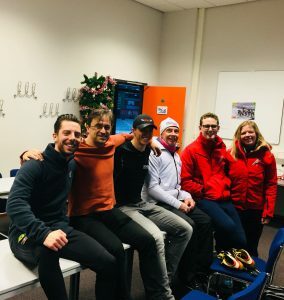 In order to take part in Long Track, due to Great Britain not having a long track rink, members of the club regularly travel to the Netherlands throughout winter to train and compete. Within Speed Skating there is the opportunity to compete at various different levels, from entry level club competitions for those taking their first steps within the sport, through to national and British competitions to international events including the World Championships and the ISU World Cup Circuit. Skaters can also progress have the chance to train at clubs in other countries. Skaters need to have completed the GOSK8 grades to be Abe to try speed skating. Inline – At this moment in time the club is searching for a new venue to run inline speed sessions, however, keep an eye on this page or the club calendar for changes. Longtrack – The club regularly travels to the Netherlands between October & March to train. Anyone wishes to come and try the sport is more than welcome. Contact secretary@skateipswich.com to register your interest and the club will contact you to make arrangements. Short Track – The club doesn’t currently the part in Short Track, but members occasionally travel to other skating clubs in Britain to try/train for Short Track. Anyone wishes to come and try the sport is more than welcome. Contact secretary@skateipswich.com to register your interest and the club will contact you to make arrangements. Tom started coaching speed skating in 2010 starting in Inline Speed Skating before transferring to Long Track in 2014. In that time, Tom has coached at International level in both sports, having been part of the GB team at the 2013 Oostende Roller World Championships as well as regularly coaching GB Longtrack. 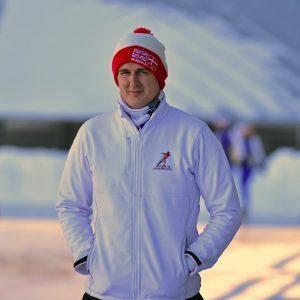 Tom currently coached GB Longtrack at ISU Junior World Cups and is part of the team responsible for developing the UK’s coaching qualifications for Long Track Speed Skating. Tom has also been heavily involved in the development of British Speed Skating having been Chairman of the Federation of Inline Speed Skating (FISS) as well as currently being the Secretary of the UKLongtrack Foundation, a dutch non-profit company that manages UK Long Track Speed Skating.